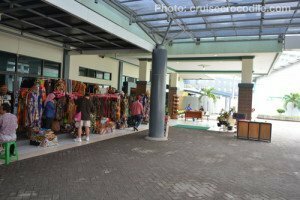 Our Semarang cruise port guide gives you information about the docking location, cruise dock, transportation options and much more! 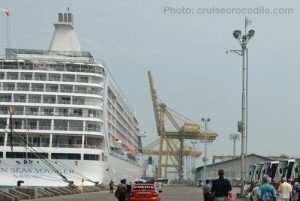 Welcome to the Semarang cruise port guide. Semarang is a mega city of 2 million inhabitants. This bustling city is a reflection of modern Java. You will find the super malls along side the old Dutch colonial quarter. Learn about the Chinese heritage in China town or at the amazing Sam Poo Kong temple. Everything shows that different groups have mixed and mingled here at one point or another. Enjoy the diversity of the city in combination with the beautiful modern culture of Java. 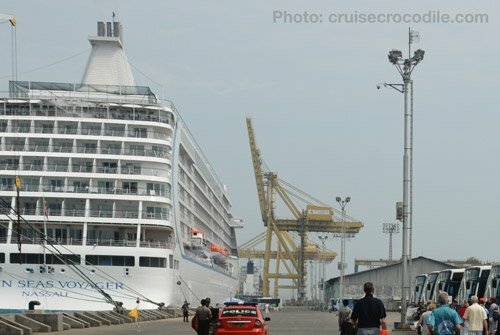 The town of Semarang is not the only reason the cruise ships visit Semarang. It is also the gateway to Borobudur. This is one of the most impressive sites in the world, that nearly made it on to the list of 7 wonders of the world. The cruise ship dock at the industrial port of Tanjung Emas. This is your view from the ship. The green building is the cruise terminal that has lots of facilities inside. The cruise terminal offers currency exchange, wi-fi, tourist information and taxi information desk. At the exit of the cruise terminal you will find a souvenir market where you can pick up your local souvenirs. At the cruise terminal you will find a taxi information desk. The prices are on display here. Please know these prices are not fixed and you can still negotiate. The taxi prices are listed above. 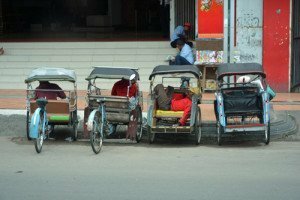 The traditional form of transportation is the rickshaw. Although you won’t find them as much as back in the days they are still in full operation to give you a ride around town. 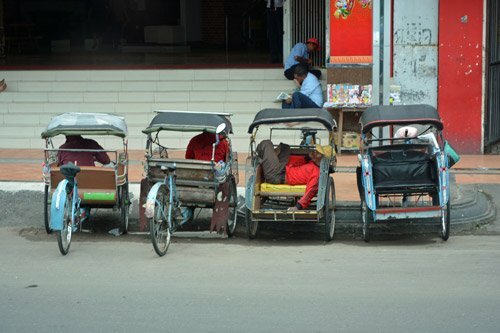 You will not find them at the port, however you will find them in the city centre of Semarang. Spot one and negotiate a deal for a city tour. 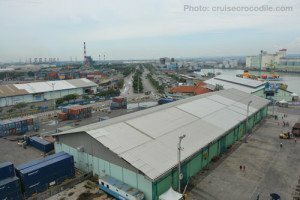 After sailing into Semarang your cruise ship will dock at Tanjung Emas, the port of Semarang. You will find there is modern cruise terminal with all kinds of facilities waiting for you there. 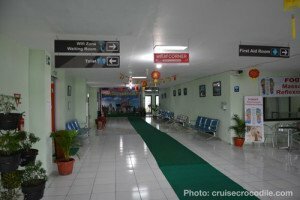 In the cruise terminal you will find free wi-fi, souvenir shops, currency exchange, tourist information and a taxi information desk. The dock is about 5 km away from the city centre. 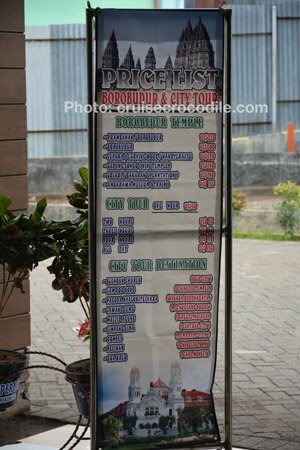 Therefore you will need some sort of transportation to get out of the port area and into the city or to Borobudur. Most ships offer a shuttle service, check with the front office on board what will be the plan for your call. Semarang is a mega city and traffic jam occur on a daily basis. 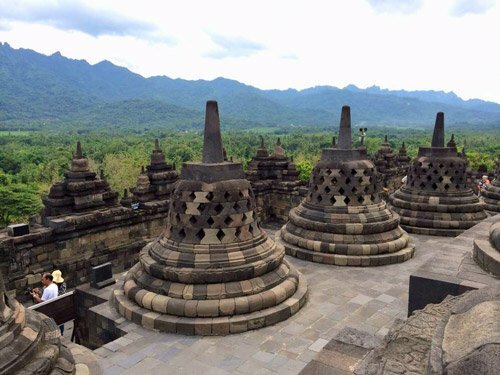 We highly recommend to use your time wisely, especially when planning a trip to Borobudur. Take into account the trip to Borobudur could take up to 3 hours one way. Make sure to always stay ahead of the ships excursion busses. When in 1682 the Dutch gained the exclusive rights over Semarang they started to build their own neighbourhood. Semarang would become an official Dutch East India company in 1705 where the Dutch would benefit from the tobacco plantations and other industries. The area they build and lived is nowadays Semarang’s old town. Walk through the 18th and 19th century streets to get acquainted with the local history. Semarang is home to the Nyonya Meneer Museum. It is the first herbal museum of the city and it tells the story of what the medicinal value is of herbs and they can be used in every day products. The most famous product is Jamu. This is an ancien Indonesian herbal medicine from the 8th century and is considered a healing potion. Learn more about this product and many others at the museum. In between the old Dutch Warehouses you will find the Gereja Blenduk church. It was build in 1753. It still stands witness to the history with the Dutch and nowadays it is one of the most unique churches to visit in Semarang. The main site to visit from Semarang would be Borobudur. It is a colossal monument and the largest Buddhist temple in the world. It was build by the Shailendra dynasty in 800 ad. After it was taken by nature and buries under a thick layer of jungle it was rediscovered by Stamford Raffles in 1814. The drive to it is very scenic where you get a good sense of everyday life outside the cities of Java. Keep in mind it is also a very long drive of 105 km or 56 miles. This trip could take up to 3 hours one way, however it will definitely be worth the trip to visit this unique site! Just outside the city centre of Semarang lies the Sam Po Kong Chinese Temple. It is the oldest Chinese temple in Semarang. It is a large premises with several temples on it that all serve a different purpose. We would recommend going with a guide to get a better understanding of what this temple is used for. Aside from the local pasar (market) and souvenir markets you will also find the big malls in Semarang. Citraland Mall is a perfect example of a modern mall where you will find all the international brands. Surrounding the mall you will also find more traditional malls with local brands.